After two decades of practicing cosmetology, Alison Plumley was ready for a change. At 40, she decided to earn a degree through her local community college. A few years later, she was accepted to NC State to pursue a bachelor’s in environmental science. On the surface, Plumley is a first-generation college student chasing her goals. What you may never notice is that she juggles her coursework, internship and family life with food and housing insecurity. 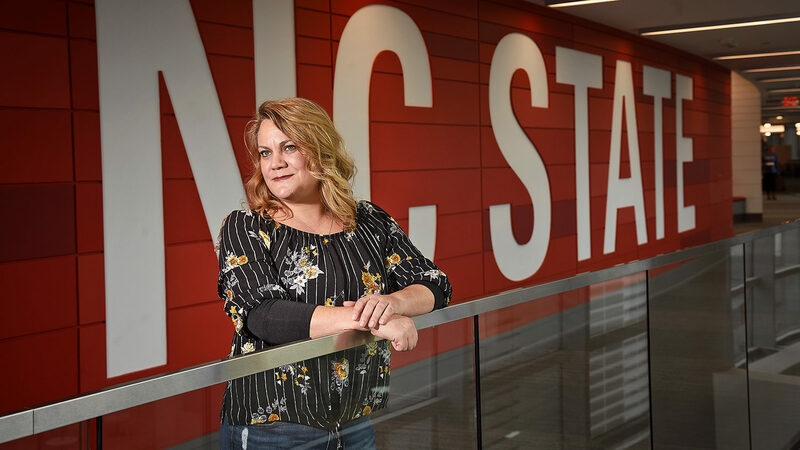 After her first semester at NC State, Plumley made the decision to leave her husband and move with her two children to Raleigh. But without a solid income, finding affordable housing was a challenge. She turned to NC State’s TRiO program for help. TRiO is a federal program that provides academic, financial, career, personal and cultural support to under-resourced undergraduate students. NC State’s program provides assistance to 285 students, including Plumley. TRiO works with programs across Wake County, including Family Promise, which helped Plumley access emergency housing. I feel like pursuing this degree is how I can break the cycle for my own children and give them a better life. Plumley says that TRiO and other support systems at NC State have helped her stay on track, but that there are still challenges outside of the classroom ahead. Plumley, who has aspirations for a Ph.D. in parks, recreation and tourism management through NC State, is on track to finish her undergraduate degree in 2020. This year, NC State researcher and psychology professor Mary Haskett found that one in seven students on campus had experienced food insecurity in the last 30 days. One in 10 students had experienced housing insecurity in the last 12 months. Do I eat three meals today, or do I pay for gas to get to campus? Should I stay in school or pay my rent? Can I take on an internship, or do I need to work another paying job? Through her research, Haskett sought to quantify the number of students asking those questions — and to work with on- and off-campus partners to find ways to address the issue. She has conducted research on family homelessness for a decade, but discovering it on campus pushed her to do more. Since 2012, the Feed the Pack food pantry has served students, faculty and staff through the generosity of donors and volunteers. With her research in hand, Haskett and others at NC State formed a steering committee to further study and address the issues of food and housing insecurity on campus. Over the past year, the committee — which includes faculty, staff, students and off-campus partners — has evaluated available programs and worked to streamline resources to a centralized online source, Pack Essentials. Through Pack Essentials, students can apply for emergency funding and connect with other resources to help navigate difficult situations. While NC State has a variety of resources in place to support the campus community, one barrier to access remains. Across the university, people are working to break down stigma and help students gain access to the help they need. Faculty in the Department of Biological Sciences created guidance documents for faculty around inclusivity and how to help under-resourced students. The first-year common reading, $2.00 a Day: Living on Almost Nothing in America, helped students tackle economic inequality and understand challenges some of their classmates may face. And University Dining created a meal swipe donation program that allows guest meals to be donated each semester. NCSU Libraries is also doing its part to raise awareness through the work of immersive scholar Lucas Swick, whose generative art display using Haskett’s food and housing insecurity research debuted in November. As he was delving into the data, he met with students who were experiencing food and housing insecurity. 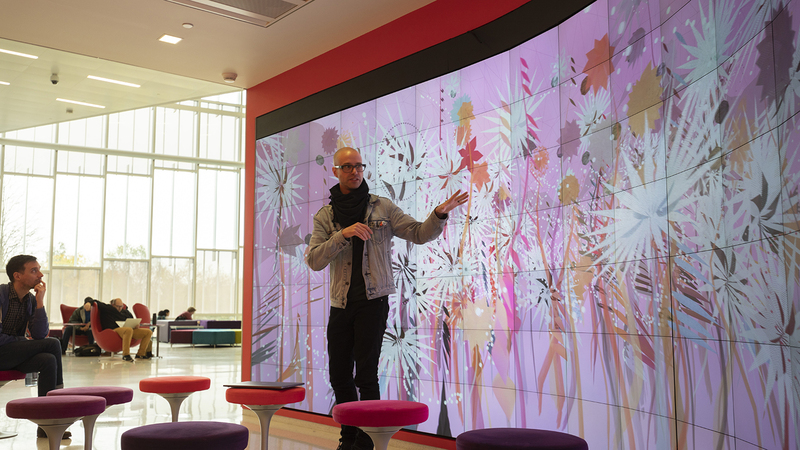 Swick’s display takes Haskett’s data and displays it as a digital garden. Some plants are healthy and colorful: Swick says these represent students who are well-fed and who have stable housing. Other plants may be smaller or struggling to get sunlight; these represent students who may not have adequate resources. Swick hopes people will become more acquainted with the data, and with the issue, through his work. Community Gardens is on display at the James B. Hunt Jr. Library and available online. The Feed the Pack food pantry recently moved to a larger, more central location on campus. Melissa Green, NC State director of leadership and civic engagement, said she hopes the pantry’s new location will help reduce stigma around food insecurity. Off campus, community organizations like A Place at the Table are working to ensure people can ask for help with dignity, and build relationships in the process. Maggie Kane, the owner and NC State alum, says she and her team are a resource for students, faculty and staff who need help or who want to help. 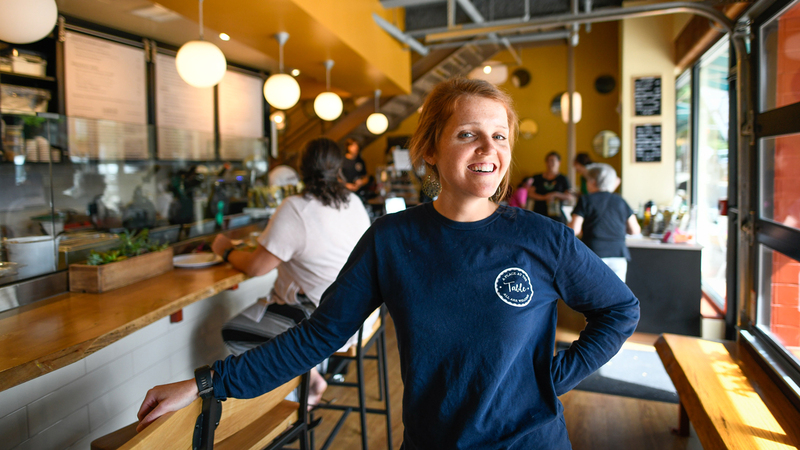 Maggie Kane, owner of A Place at the Table and winner of NC State’s 2018 Young Alumni of the Year award. 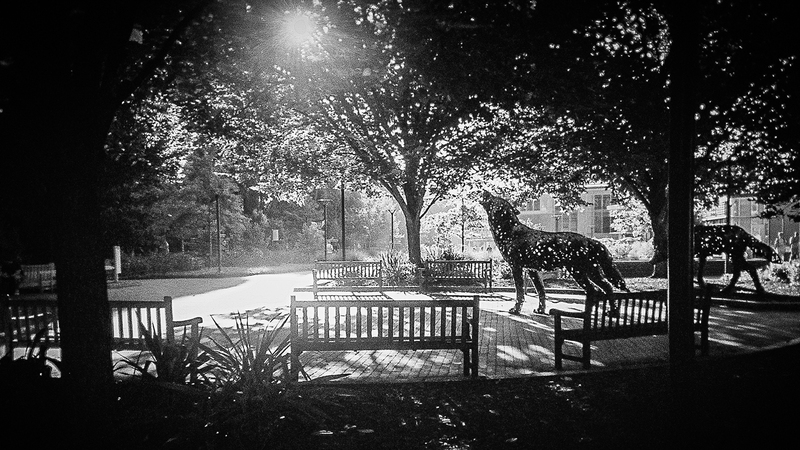 Your gifts help support the Feed the Pack food pantry and Student Emergency Fund. As awareness and acceptance grow, the number of individuals on campus experiencing food and housing insecurity may decline. Time and data will tell, as Mary Haskett is conducting qualitative research interviews with students this semester and hopes to conduct another survey of campus in a few years. “I hope people will come to understand the extent and significance of the challenge of hunger and homelessness among our students,” Haskett says. “These are incredibly bright, motivated students who are working, often several jobs, and doing without basic needs so they can complete their education at NC State.